It’s hard to believe but we’re a week out from closing the books on the first month of 2019. The coming season looms large and the December doldrums have been replaced by days filled with a lot of time on the phone booking and confirming trips and lodging. Lately we’ve also spent some time shoveling snow which we haven’t had to do much of so far this winter. While we’re keeping a close eye on the snow pack and spending some time on the water battling ice in the guides we know that the season will soon be upon us and winters cold will be but a distant memory. After all, spring is a mere 55 days away. Can you feel it? I’ve admittedly become less of a fan of winter fishing over the past several years, perhaps I’m getting soft in my old age. But I do love this time of year. There may be snow on the ground and the thermometer may be hanging south of 20 degrees but spending time on the phone much of the day talking with clients about their upcoming fishing plans has a way of transporting you to hot summer days in the rowers seat. As the rooms and the guide days fill in the season begins to take shape, once again shifting gears from contemplating what was to preparing for what’s coming SOON. Bookings for the prime season are up from last year which means a lot of you have fishing on your minds. If you’re thinking of fishing and staying with us this season it’s probably time to stop thinking about it and make those reservations. 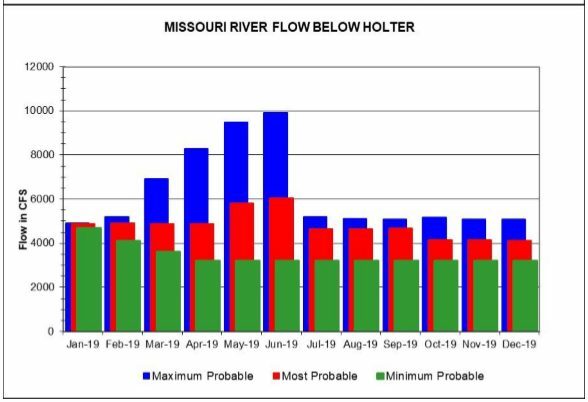 It feels like it’s going to be a busy year on the Missouri, especially after we lost a good part of the dry fly season last year due to the high water. There are a lot of folks who skipped last year who’ve already secured their dates for 2019 so don’t let this one get away from you. 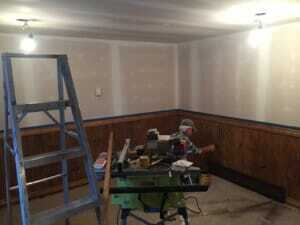 There’s so much to do to get things ready for the coming season and not a lot of time left to get things done. Time has run out on putting off winter projects…its go time for property maintenance and also for shop stuff. The cold weather gear needs to move to make way for spring shipments which will be arriving soon. We’ve already received our big SIMMS wader and boot shipment and while those waders look great hanging in the shop, they’d look even better leaving the shop on you so if you’re in the market for new waders this spring we’d love it if you got them from us. It’s also time to review preseason orders and make sure we didn’t miss anything. Rest assured we’ll have everything ready to go come spring. 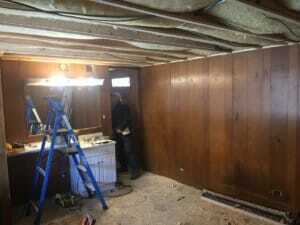 Our major project is completing renovations in the motel which will commence next week. Upon completion of #11 all motel rooms will be fully renovated and while some of you have only ever stayed in the renovated version of the rooms those who have been with us from the start will appreciate what I’m talking about when I say it’s nice to be able to be proud of these motel rooms because I definitely wasn’t prior to the renovations. Another winter project was getting the WiFi situation figured out. This has been a constant issue and one which we’ve made several attempts to fix. The problem was that the WiFi signal was not reaching the bungalows (#12,#13 and #14). Well, it is now. Mind you we don’t have the fastest internet in Wolf Creek but we have the best that is available to us and now that signal is covering the whole property. As always you can expect continuous improvement at Wolf Creek Angler. It’s our mission to do everything we can to provide you with an excellent experience and one which you’ll hopefully remember for all the right reasons. It won’t happen all at once but we’re chipping away at things and judging by our annual growth and by the vast majority of the feedback we receive our efforts are making a difference. Perhaps it’s a little early to start talking about what we’ll see for water this spring but since we’ve already been fielding plenty of calls on the subject here’s what we know. 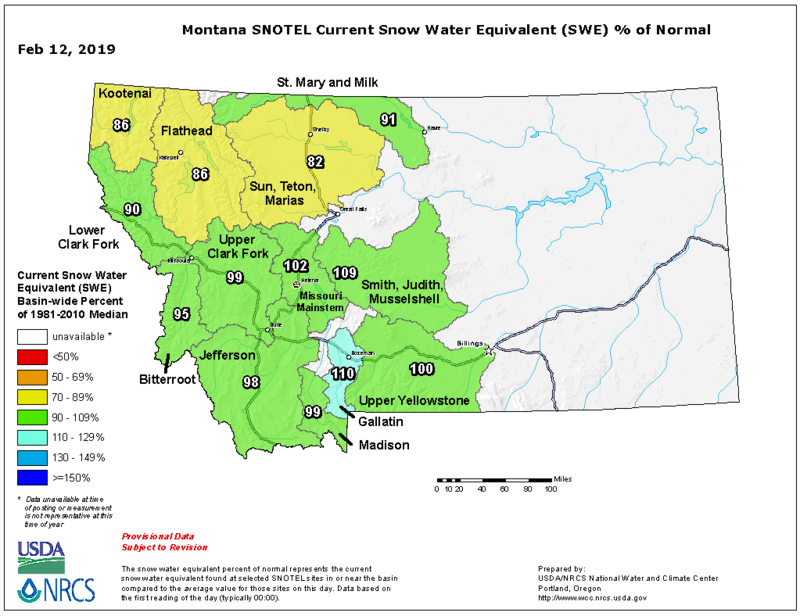 Snowpack across western Montana is currently sitting in the 80-90% of normal range. It could be much worse but the fact is we could use some precipitation. Following record precipitation last year, this winter has been a return to what has unfortunately become somewhat of the new normal. The January long term forecast is for above average temperatures and below average precipitation which could translate into a busy month of fishing on the Missouri while those waiting for the ice to form on Holter Lake may be waiting all winter long. We’re thankful for any business we get during the long winter months so we’ll take the traffic but here’s hoping for some major precipitation over the next couple of months. Regardless of snowpack, we’re anticipating a great year ahead on the Missouri. 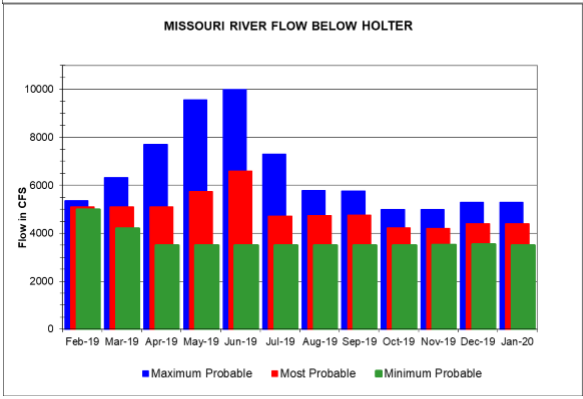 River flow predictions are calling for a likely scenario of flows holding steady in the 4,500 CFS range through the winter months and peaking in the 6,000 CFS range in May and June. This is great news to the wade anglers who missed out on fishing the Missouri last spring. Max flow predictions show flows holding in the 4500 CFS range through February and then bumping up around 1000 CFS each month through June with a peak in the 10,000 CFS range while the minimum flow predictions show a steady drop in flow over the winter, leveling off in the 3500 CFS range beginning in April and holding there for the remainder of the season. This is not ideal. Let’s hope we see the most probable scenario (or max probable) play out. We’re anxious to see what effect last season’s high water scrubbing is going to have on the hatches this year. It could be an epic dry fly year on the Missouri! Will we see the caddis explosion that has occurred following high water years in the past? Only time will tell. 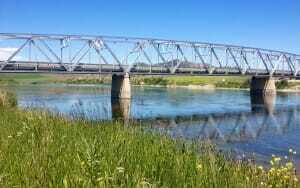 One thing looks fairly certain however, that being that we will actually have dry fly fishing before July. We missed much of the traditional dry fly prime time last season so we’re anxious for some BWO and PMD activity. As per usual this is all speculation. We’re using the best information we have available to loosely predict what we might see this spring but Mother Nature always has the last word. We’re not climatologists, we just sell fish hooks for a living so we’re content to leave the actual business of forecasting to the experts. 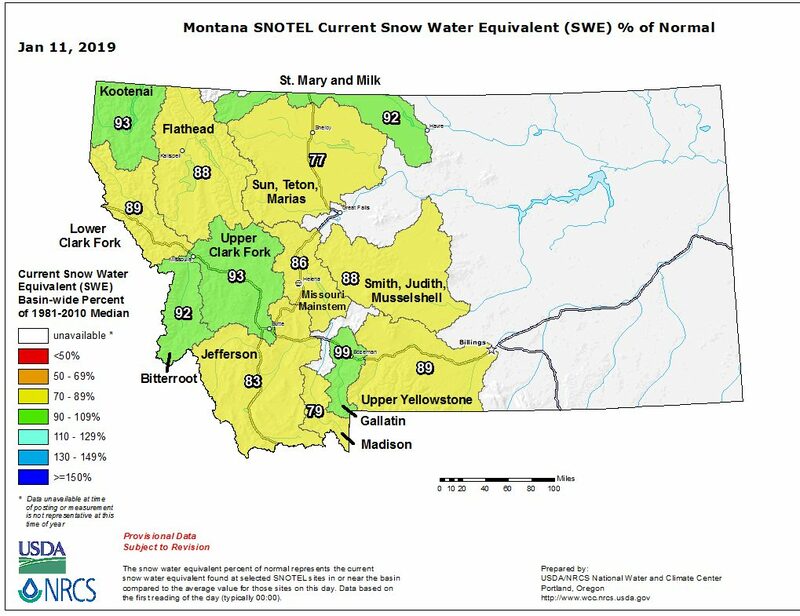 We’ll keep you up to date on snowpack and flow conditions all winter long but at this point it definitely feels like it could be a return to dry fly nirvana on the MO in 2019. In the meantime winter fishing is HOT right now. The nymphing is good to great depending on the day and streamers have been effective both on the swing and the strip. We’ve seen some midge activity with sporadic feeding. If we continue to see mild conditions throughout the winter expect good midge fishing as early as late January and throughout February and March. We’ve been busy with lodging and have been getting a lot of calls about our winter lodging and guide trip special. The rumors are true! $500 for a full day guided float trip on the MO and TWO nights of premium lodging at Wolf Creek Angler. Our lodging options are quite limited during the winter so things tend to fill up quickly. If the mild weather persists and the demand is there we may look at opening more lodging up sooner rather than later. We’ll keep you posted. In the meantime – give us a call and book your cure to cabin fever today and while you’re at it, make those spring/summer plans if you haven’t done so already. Prime dates are filling fast. One week into 2019 and we’re off to a fishy start having done our earliest ever guide trips on January 3rd. It looks like we’re in for a mild winter so hopefully we’ll be running a bunch more trips and while we may be losing out on some lodging for the ice fishing crowd (zero ice on Holter to date) I think we’ll more than make up for it with river traffic. The Wolf Creek Bridge parking lot looked like July this weekend with rigs filling the pretty yellow lines. It’ll be interesting to see how that all works out this spring when things are going full bore. At this point, with around a dozen rigs in the lot (roughly half full), it felt a little crowded but I’m sure everyone will adjust just fine this spring when it’s all about the peace and harmony. The forecast is calling for highs in the 40’s for the majority of the ten-day outlook with no high wind warnings and zero chance for precipitation in the mix (though it is howling today with 40 mph gusts). 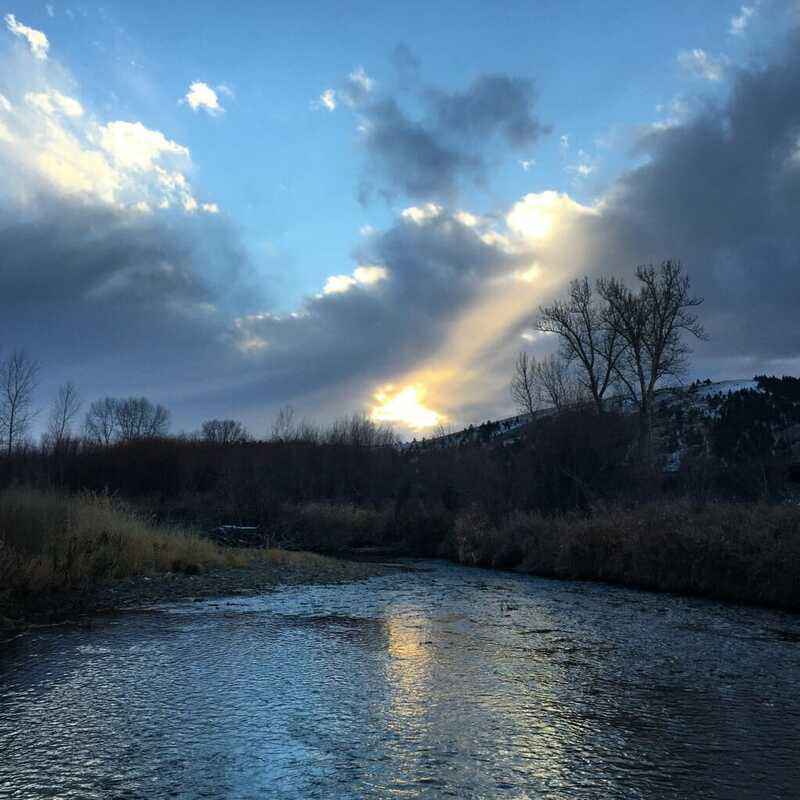 The January outlook is for above average temperatures with below average precipitation which means there’s no time like the present to book yourself a winter guide trip with Wolf Creek Angler. $500 for a full day Missouri River guided float trip for one or two anglers AND two nights of premium lodging all winter long! Guide trips only with no lodging are $400 and lodging with no guide trip is $99/night plus tax. Try to find a better deal on the Missouri…. I guarantee you won’t. Winter fishing techniques are a go. Deep nymphing and swinging or slow stripping streamers are what you should be doing from here on out. Deep, slow water…. double nymph rig 7’ – 9’ overall with or without split shot (your call). I like a #12 Pink Amex or Rainbow Czech paired with a #16 or #18 caviar scud, Petersen’s Sow, Pink Lucent bead Ray, Tailwater Sow, soft hackle sow, Zebra Midge, Pill Popper, UV Crush, Cotton Candy etc. They’re all good. They’ll all catch fish if the time is right and you get them in the zone. The best time of day has been in the 10:30 am – 2:30 pm zone. Nighttime lows are dropping into the 20’s so no point in starting any earlier than 10 am. Let things warm up a bit, you’ll be glad you did. Predictably, most of the traffic has been in the upper stretches but with things being as mild as they are there’s no reason you shouldn’t be fishing below Craig or right on down through the canyon. Hot head Kreelex, Brown and Yellow Kreelex, Skiddish Smolt and Polar Leeches in various flavors have been the go-to options for swinging. I’m still stripping Sparkle Minnows, MK Ultra and Ultralites, Dirty Hippies and D & D’s and occasionally trailing a Polar Leech off any of them and moving plenty of fish. There have been plenty of folks staking out their claims and swinging out there and there’s been no shortage of walk/wade nymphers as well. If you’re fishing from a boat, be courteous and grant them their space. It may be busy by winter standards but there’s miles of good water. No need to crowd anyone. The water temperature is holding steady in the 35-degree range which is right about where it should be. 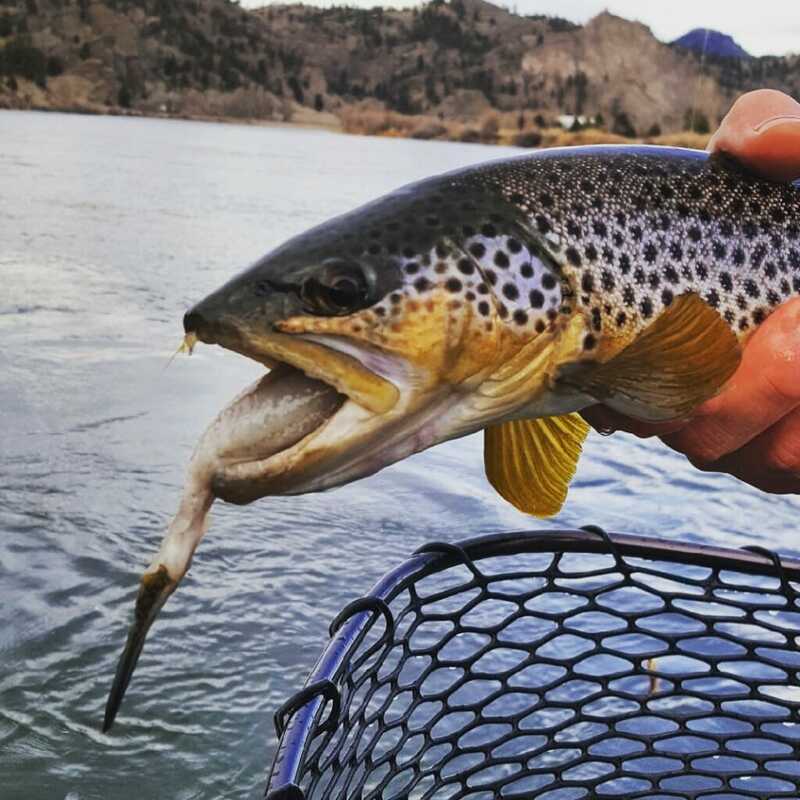 The fish are not going to expend a lot of energy chasing down a meal whether it’s a nymph or a streamer though I’ve found that you’re much more likely to entice the chase with a streamer when they’re looking for a quick calorie fix. 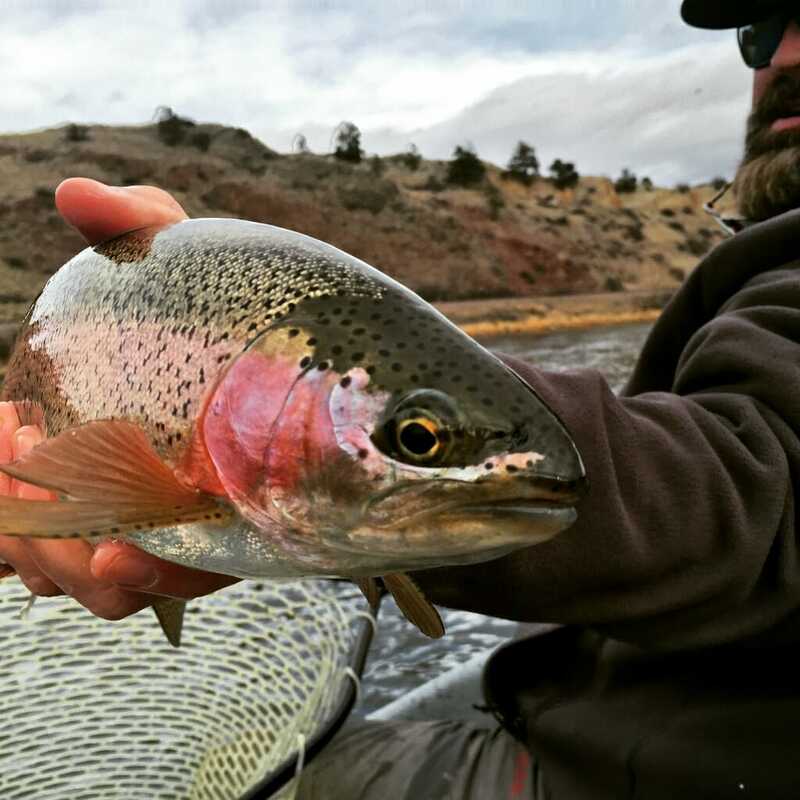 Once again, whether nymphs or streamers you’ll want to get them deep enough that the fish don’t have to move much for them. If streamers are your thing you should be dredging right now and stripping ever so slowly. Embrace winter fishing on the MO’. After all, spring is still a long way off and you can’t sit inside all winter long. Make plans to escape to Wolf Creek and enjoy winter solitude on the Missouri. The shop still closed on Mondays and Tuesdays for the time being but we’re always open for lodging and guide trips and speaking of that…have you booked your dates for spring and summer yet? If you haven’t you should. Prime dates are filling fast. The First Day of Winter has us thinking SUMMER! The Winter Solstice is upon us. The shortest day and longest night of the year. It’s a special day as it means we’ve crossed that threshold officially beginning the countdown to summer 2019. Sure, we’ve got a long ways to go but beginning tomorrow each day will be a little bit longer and before you know it we’ll be right back into Prime Time on the Missouri. But let’s not get ahead of ourselves. The Winter Solstice is the moment at which the Earth’s axis tilts the Northern Hemisphere farthest from the sun’s warmth. This year’s Winter Solstice is unique in that it coincides with the onset of the December Full Moon. Often referred to as the Cold Moon, December’s full moon is also known as the Long Night Moon, the Moon Before Yule and the Oak Moon. 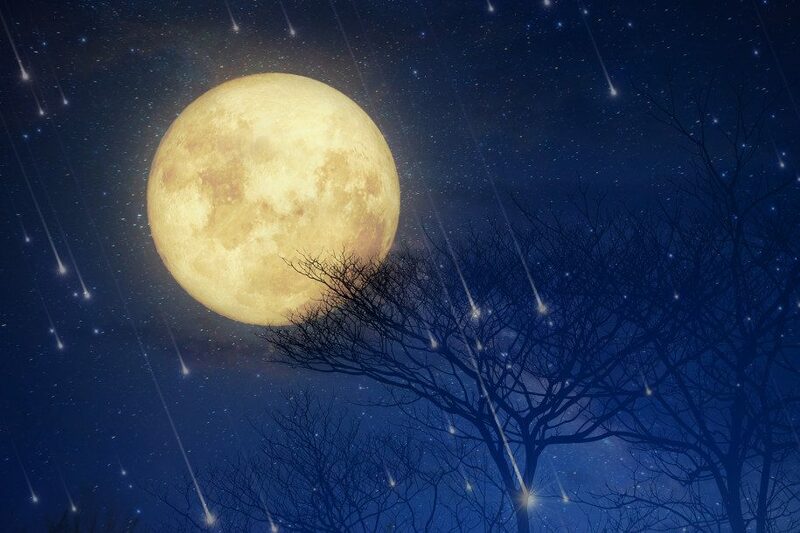 Along with the Cold Moon the Ursid Meteor shower will also be visible in the night sky during the longest night of the year. The forecast is calling for a mostly cloudy night in our neck of the woods but if you can find yourself some clear skies it could be quite a show. As if the Winter Solstice weren’t reason enough to celebrate we’re also just a few days out from Christmas with New Year’s Eve looming so while the longest night of the year might not sound like a cause for celebration if you focus on what’s beyond it like holiday festivities and more importantly like long summer days and bugs and trout you’ve got every reason in the world to celebrate! We’ll be raising a glass tonight, how about you? Why not continue the celebration by spending the first weekend of the winter on the Missouri. The weather looks to be decent with sunny skies on Saturday, mostly cloudy skies on Sunday and highs near 40 both days and while the winds continue to howl today the forecast looks favorable for diminishing winds beginning tomorrow. 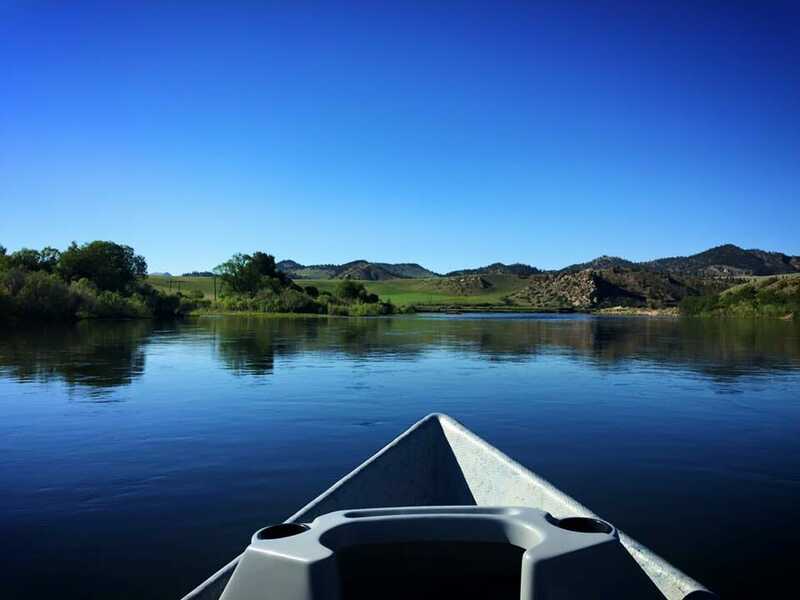 Knock out your last minute Christmas shopping at Wolf Creek Angler and treat yourself to a day or two on the water. We’ve got all kinds of great deals going on right on through Christmas on the stuff they really want, not just the stuff that didn’t move this year. Waders, boots, rods, reels, sportswear, outerwear and much more from the best brands in the business….all at the best prices of the season. You can’t afford to pass these deals up. We’ve also got lodging available for $99/night and guides on call for $400 full day Missouri River guide trips just in case you want to make a weekend of it. Remember, $500 (plus tax) gets you two nights of premium lodging and a full day Missouri River guide trip for one or two anglers all winter long. This is the best deal you’ll find on the MO this winter, hands down…we guarantee it! All has gone quiet on the Missouri save the wingbeats of the waterfowl and the occasional volley of shotgun blasts. The water temps have dropped into the high 30’s and with single digit overnight temps expected ice will start to be an issue on the lower reaches of the river. It’s time to turn your attention to the winter water. Deep and slow. That’s where you will find them. Deep rigs with a bb or two and something pink….there’s your Missouri River winter nymphing rig. Use it from here on out all winter long. Fishing pressure has been close to non-existent and I wouldn’t expect that to change much for the time being though with temps climbing back near 40 this weekend and into next week you might see a few folks out there looking for a winter fix. December is definitely our slowest month of the year. People generally put fishing on the back burner during the holidays and we don’t see a lot of holiday shopping traffic as most people stick closer to home to do their shopping. That being said, for those willing to make the trip we’ve got all kinds of great gift ideas and with end-of-the year pricing in effect we’ve got the deals you can’t afford to pass up on the good stuff. We’re doing a Redington wader and boot blow out sale clearing the way for our spring shipment of Simms waders and boots which will arrive next month. Forty percent off all in-stock Redington waders and boots until they’re gone. We’ve got Palix, Sonic Pro, Sonic Pro HD, Sonic Pro HDZ, Women’s Sonic Pro, Women’s Willow, Women’s Siren and youth Crosswater waders. For boots we’ve got Skagit and Prowler as well as women’s Willow boots. They’re going fast. Call or message the shop before you come out for current inventory. Can’t make it out to Wolf Creek? No problem. We’re happy to ship anything anywhere. In addition to the big Redington sale we’ve got great sale prices on all of our outerwear and sportswear and if you’re looking for a rod and reel look no further. 25% off all rod/reel combos now through the end of the year. And while we’re talking about deals….don’t forget our winter guide trip and lodging special. $500 for a full day guide trip and two nights of premium lodging. Nobody, and I mean NOBODY is going to beat this deal! If you don’t need the lodging winter trips are $400 for a full day for one or two anglers. If you don’t need the guide but do need lodging our winter rates are $99/night plus tax for premium lodging complete with full kitchen and private bath. A few more weeks and we’ll be turning the corner. Longer days lie ahead. From what I’m hearing it sounds like we’re in for a somewhat mild winter. 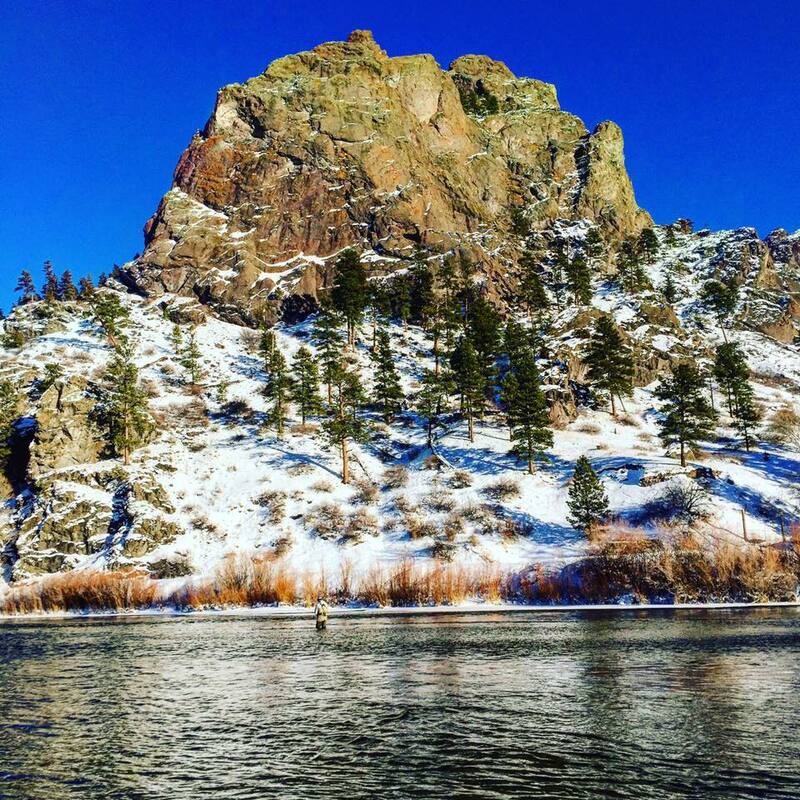 If so, we hope to be a part of your Missouri River winter fly fishing plans. Despite a fairly warm week ahead we’ve decided to proceed with shutting down a few more cabins for the winter as it seems things have pretty much slowed to a halt. Not to worry. 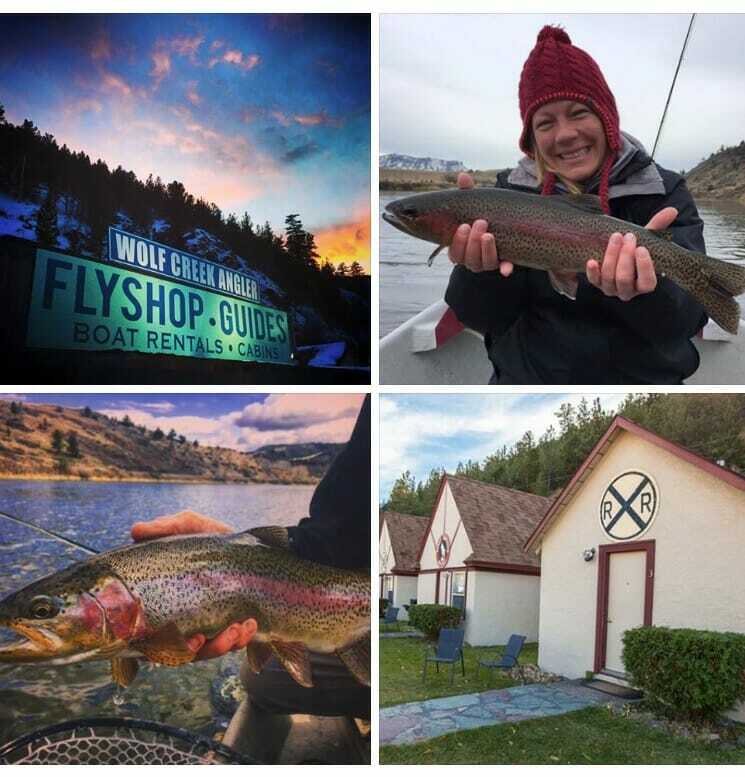 We are open for business all year but for all intents and purposes the 2018 season is in the books, capping a fifth successful season for Wolf Creek Angler! Effective next week our winter business hours will be Wednesday – Saturday 8:00 am – 4:00 pm and Sunday 8:00 am – 12 noon. As per usual you can expect to find us here any day (including Monday and Tuesday) if the weather dictates it and likewise we may opt out if hazardous conditions pose a traveling risk or if it’s just too damn cold to fish. We are open for lodging and guide trips EVERY DAY. Don’t forget our MOvember special – $500 for a full day guide trip and two nights of premium lodging. You won’t find a better deal anywhere! 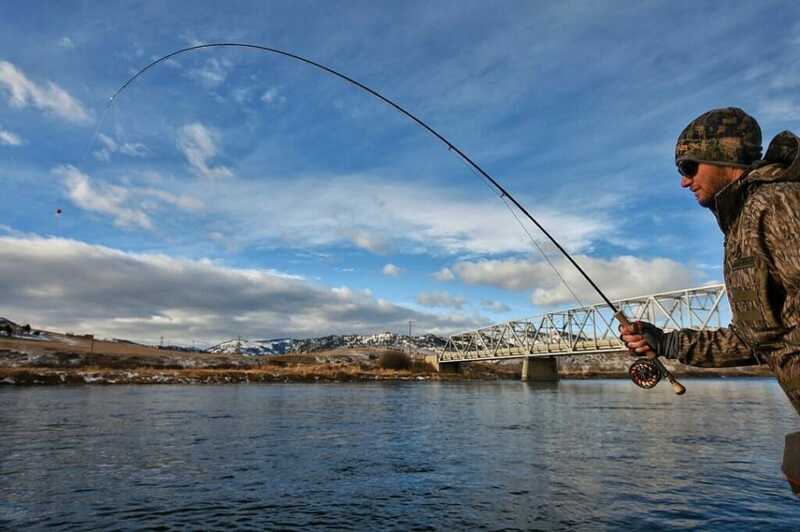 The “fishable” weather parameters tend to shift and evolve as the winter drags on. We’re looking at temps in the mid to high 40’s this week but I don’t expect much traffic. If we see these types of conditions come January however you can bet we’ll be booked solid and busy in the shop. Mid November through the end of the year is our slowest time as people get busy with the holidays. Many are focused on hunting and have already long since put away the fishing gear for the season. That being said, we will see a bump in traffic (weather permitting) as the colleges go on winter break in a couple of weeks. It’s been an awesome fall for fishing the Missouri and elsewhere in the state. We couldn’t have asked for better conditions. The weather was great and this was hands down the best fall fishing I’ve seen since moving to Montana. Dry fly fishing will still be an option for the next couple of weeks though it appears as though sunshine will prevail much of this week which is not great for dry fly or streamer fishing. Plan on settling in to winter nymphing but keep your options open. Bobber fishing will be your best bet for numbers from here on out but keep that dry fly rig and that streamer stick at the ready. It’s time to start thinking winter fare….Firebeads, Sows, Pill Poppers, Pinkalicious, Pink Amex, Rainbow Czechs, Cotton Candy, UV Crush, Zebra midges, worms, Bubble Yums, Soft Hackle Sows…etc. Water temps are still holding in the high 40’s so you’ll still find the fish spread out in a variety of water types but you’d do well to start focusing on the deeper, slower winter runs. We’re running fairly deep (7’-9’ overall) and usually running a tungsten bead point fly along with a bb or two. 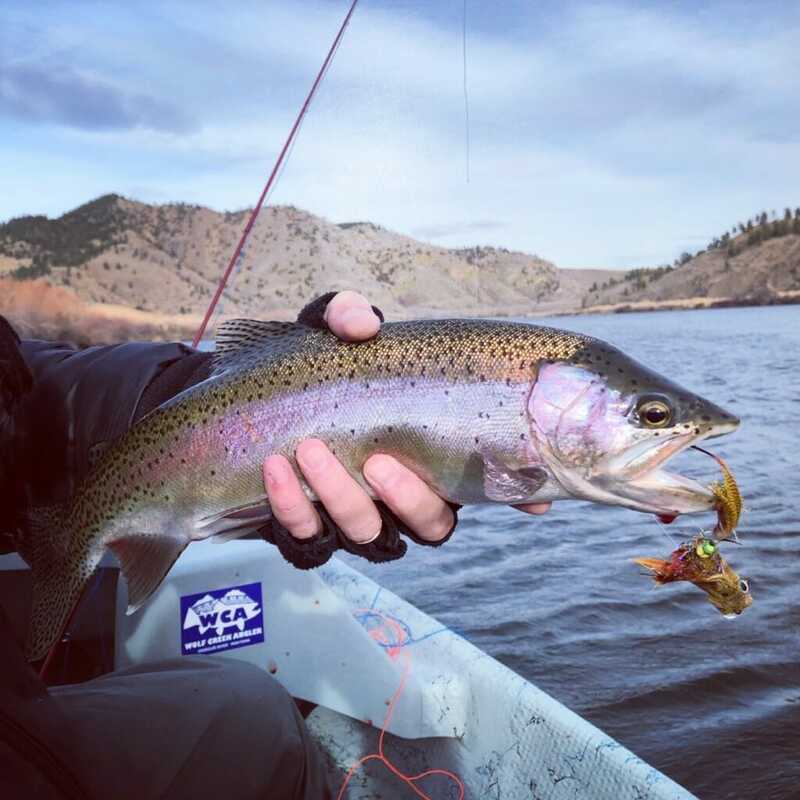 I wouldn’t say we’ve exactly got things dialed for winter quite yet as water conditions are in flux but it won’t be long and you’ll be fishing the same water with the same bugs and the same rigging for days at a time. BWO’s are definitely a possibility….keep your dry fly rod rigged and ready, especially on the overcast days. Streamer fishing has been solid and will continue to occupy our time. Some are shifting into Trout Spey season, others are content to stick to the single handed techniques. Either way, this is your time. Get after it. Chewy has returned to the tying bench for the winter so expect all of your favorite ZK patterns to be back in stock SOON. In the meantime it’s getting to be Kreelex, Skiddish Smolt and Polar Leech time and it’s always Sparkle Minnow season! As the Christmas shopping season approaches we hope you keep us in mind to help you take care of the anglers on your shopping list. We’ll do a Holiday Gift Guide soon but in the meantime we’re happy to provide you with personalized gift ideas…just give us a call. A new rod and reel, a new fly box filled with Missouri River flies, new waders, new boots, a Missouri or Blackfoot River guide trip? The options are limitless. Give us a call or drop us a line, we’d be happy to give you some ideas to fit any budget. Judging by the abundance of vacancies and the lack of traffic in the shop I’d say the 2018 season has pretty much drawn to a close. We’re currently sitting just shy of 30 degrees with a light snow falling. More of the same on tap through tomorrow with lows dropping into the teens the next couple of nights. While these aren’t exactly prime fishing conditions we’ll see highs climbing back near 40 by the end of the week which could translate into good fishing and a good opportunity to spend a little more time on the water before winter sets in. To encourage you to make the journey we’re offering a late fall/winter special you can’t afford to pass up. We’re calling it the MOvember SPECIAL but it will be in effect all winter long. We are offering full day Missouri River Guided float trips for one or two anglers for $400 or two nights of lodging and a full day on the water for $500. That’s a savings of over $300! Mind you we’re starting trips later in the morning this time of year and with the dwindling hours of daylight you’re getting a shorter trip but you won’t find a better deal anywhere. Some aren’t offering winter trips at all. Others are offering them at full price and some are offering a discount but nobody else is offering a lodging and fishing package deal and NOBODY can come close to what we’re doing. We’re offering two nights of premium lodging and a full day on the water for less than a guide trip will cost you elsewhere. Keep in mind also that while the lodging tax is always in effect, beginning November 15th the resort tax will be on hiatus until April so that’s an additional 3% savings on EVERYTHING. Lodging, Guide Trips, Shuttles, Flies, Simms sportswear and accessories, Drift Boat Rentals…..EVERYTHING! And the best part of the deal? No cancellation fees! When you book a trip during the season you are locked in and under most circumstances you will end up losing your 50% deposit. That’s not the case now. Winter can be a challenging time to book a trip because the weather can change without notice and while we don’t mind being on the water in sub-zero conditions we realize that this isn’t for everyone. Not to worry. Book your trip and rest assured that if the weather turns or if you simply change your mind you’re off the hook. No fees. No questions asked! Just looking for a place to stay on your DIY hunting or fishing adventure? Winter lodging rates are $99/night plus tax. All available units are completely furnished with a kitchen and private bath. Winter fishing on the Missouri can be downright fantastic. It can also be slow. It’s fishing! We’re concentrating primarily on nymphing and streamer fishing right now but there are plenty of dry fly opportunities as well. As we move into December and into the heart of winter fishing those dry fly opportunities will dwindle but will return in the late winter as midge fishing becomes a viable option. Winter fishing is not for everyone but once that cabin fever begins to set in a day on the Missouri might be just what the doctor ordered. Things are quiet in Wolf Creek and Craig for the winter months but we do have Shotgun Annie’s and The Oasis for dining and night life; The Canyon Store for gas, groceries and a great Montana Microbrew selection and of course Wolf Creek Angler for all of your Missouri River Winter Fly Fishing Needs. We’ve got more on-site lodging than anyone, the best winter bug selection around and all the cold weather gear you’ll need to eliminate cold from the equation. Don’t forget our lodging units are all furnished with a full kitchen and access to barbecue grills so bring your own food with you and you won’t have to go anywhere! We hope to see you this MOVEMBER and all winter long for HOT fishing on COLD days with Wolf Creek Angler.